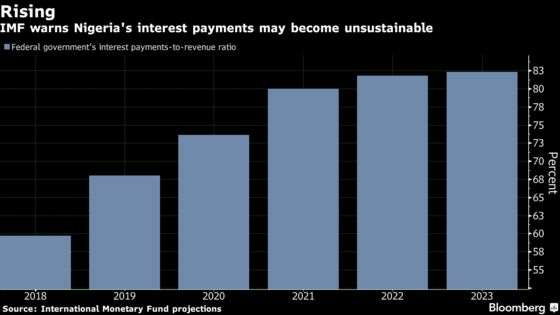 (Bloomberg) -- Nigeria may have about the best-performing Eurobonds in emerging markets this year, but the West African nation says it will prioritize borrowing from concessional lenders such as the World Bank and African Development Bank as it looks to rein in interest payments. Nigeria’s 2019 budget, presented by President Muhammadu Buhari in December and yet to be approved by lawmakers, envisaged the government issuing about 1.65 trillion naira ($4.6 billion) of new debt, half of which would be in foreign currency. Africa’s biggest oil producer has mostly used the Eurobond market for its external funding in recent years, rather than concessional lenders. It sold $5.4 billion of bonds last year and $4.8 billion in 2017, making it Africa’s most prolific issuer in that period after Egypt. Bank of America said in a research note this month that Nigeria would probably print another $3 billion of securities in the second half of 2019. Its Eurobonds have returned 14.4 percent since the end of 2018, second only to Kenya among sovereigns in emerging markets, according to Bloomberg indexes. African Eurobonds have been in heavy demand this year as the U.S. Federal Reserve’s cautious approach to raising interest rates spurs investors to buy higher-risk assets. Ghana and Benin sold $3.6 billion of bonds between them on Tuesday. Oniha reiterated that while the government is “always speaking” with the World Bank and African Development Bank, it won’t borrow from the IMF. “We’ve made it clear we’re not in the situation where we need IMF support,” she said. The DMO is continuing with a plan to increase its proportion of foreign liabilities to 40 percent to reduce funding costs. The ratio is probably somewhere between 30 percent and 40 percent following the sale of $2.9 billion of bonds in November, Oniha said. Yields on Nigerian Eurobonds average 7.3 percent, half that for naira bonds, according to data compiled by Bloomberg and JPMorgan Chase & Co.
Nigeria also plans to sell a 15 billion naira green bond, Oniha said, without giving a time frame. The country issued its first green bond, a 10.7 billion naira five-year security, early last year.